Today we're pleased to announce the launch of Making Sense of MS, our new resource designed to help people who've just been diagnosed with MS. It's a timely publication. Last week we published the results of a survey which found that only 12 per cent of people with MS got all the information they needed at diagnosis. Furthermore, many survey respondents told us they had to look online to find answers to their questions after diagnosis, and found information that was often misleading and distressing. 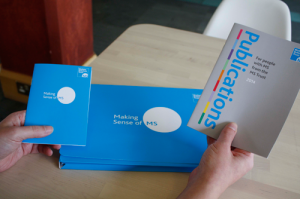 Making Sense of MS consists of a small, postcard-sized booklet, designed to be given to people as soon as possible after diagnosis, explaining the basics of MS and signposting to further reliable MS Trust resources, online and in print. It allows people to tailor their own information, finding what's right for them, when it's right for them. Sarah Joiner, Vice Chair of the MS Trust said: "I am thrilled with the new Making Sense of MS resource. It means that people get to ask the questions that matter most to them and take all the time they want to understand the answers. They can share it with family, friends, workplace: it is entirely up to them. I believe this pack will be essential to people coming to terms with their new diagnosis." Today we hear from Jane from the MS Trust information team, who has managed the project from the initial idea through to the final product.